Burnside's North Carolina Expedition, commonly referred to as the Burnside Expedition, was an objective in Union General Winfield Scott's Anaconda Plan and consisted of a series of battles along the North Carolina coast during the American Civil War (1861-1865). In January 1862, an amphibious expedition under the command of Union Brig. Gen. Ambrose E. Burnside was dispatched to the North Carolina coast to deprive the Confederacy of its vital blockade-running ports. Hatteras Inlet, during the Blockade of the Carolina Coast, had been seized by Maj. Gen. Ben Butler in 1861. Next, Burnside was sent to take Roanoke Island, capture the town of New Bern, move against Fort Macon, and proceed against the railroad at Kinston and Goldsboro. Despite the handicap of adverse weather, the first three objectives of the expedition were successively achieved. The last objective, however, would have to wait. "In accordance with verbal instructions heretofore given you, you will, after uniting with Flag-officer Goldsborough at Fort Monroe, proceed under his convoy to Hatteras inlet, where you will, in connection with him, take the most prompt measures for crossing the fleet over the Bulkhead into the waters of the sound. Under the accompanying general order constituting the Department of North Carolina, you will assume command of the garrison at Hatteras inlet, and make such dispositions in regard to that place as your ulterior operations may render necessary, always being careful to provide for the safety of that very important station in any contingency. Your first point of attack will be Roanoke Island and its dependencies. It is presumed that the navy can reduce the batteries on the marshes and cover the landing of your troops on the main island, by which, in connection with a rapid movement of the gunboats to the northern extremity as soon as the marsh-battery is reduced, it may be hoped to capture the entire garrison of the place. Having occupied the island and its dependencies, you will at once proceed to the erection of the batteries and defences necessary to hold the position with a small force. Should the flag-officer require any assistance in seizing or holding the debouches of the canal from Norfolk, you will please afford it to him. The commodore and yourself having completed your arrangements in regard to Roanoke Island and the waters north of it, you will please at once make a descent on New Berne, having gained possession of which and the railroad passing through it, you will at once throw a sufficient force upon Beaufort and take the steps necessary to reduce Fort Macon and open that port. When you seize New Berne you will endeavor to seize the railroad as far west as Goldsborough, should circumstances favor such a movement. The temper of the people, the rebel force at hand, etc., will go far towards determining the question as to how far west the railroad can be safely occupied and held. Should circumstances render it advisable to seize and hold Raleigh, the main north and south line of railroad passing through Goldsborough should be so effectually destroyed for considerable distances north and south of that point as to render it impossible for the rebels to use it to your disadvantage. A great point would be gained, in any event, by the effectual destruction of the Wilmington and Weldon Railroad. I would advise great caution in moving so far into the interior as upon Raleigh. Having accomplished the objects mentioned, the next point of interest would probably be Wilmington, the reduction of which may require that additional means shall be afforded you." 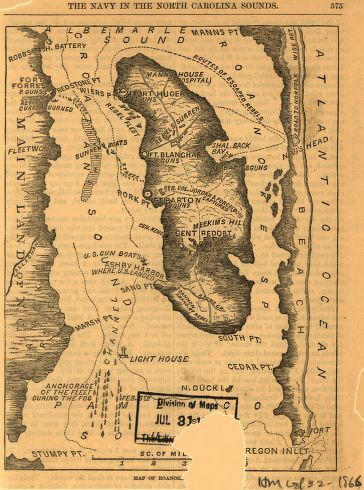 (Above) Map, February 8, 1862, with forts and batteries located on and adjacent strategic Roanoke Island, NC. The island was also defended by a variety of channel obstructions, such as wood pilings which were designed to strike the hull of a ship. The Confederate “mosquito fleet” of small, shallow draft boats would attempt to lure Federal ships into the dangerous unmarked and obstructed channel. (Right) Map of Burnside's initial route and advance to Roanoke Island, which was the first of a series of battles in the Burnside Expedition. Courtesy Clark's North Carolina Regiments. During late January 1862, a Federal land-sea expedition assembled at Hatteras Inlet to take Roanoke Island and capture control of the North Carolina sound region and its Outer Banks. The force was under the joint command of Brig. Gen. Ambrose Burnside and navy Flag-Officer Louis Goldsborough. After several delays due to bad weather, the Union fleet, consisting of dozens of troop transports and more than 20 war vessels, arrived at the southern end of Roanoke Island. 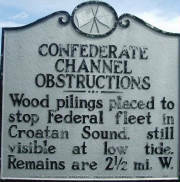 On Croatan Sound the South’s five-vessel “Mosquito Fleet” harried the Union ships but was badly battered and quickly driven north out of range. 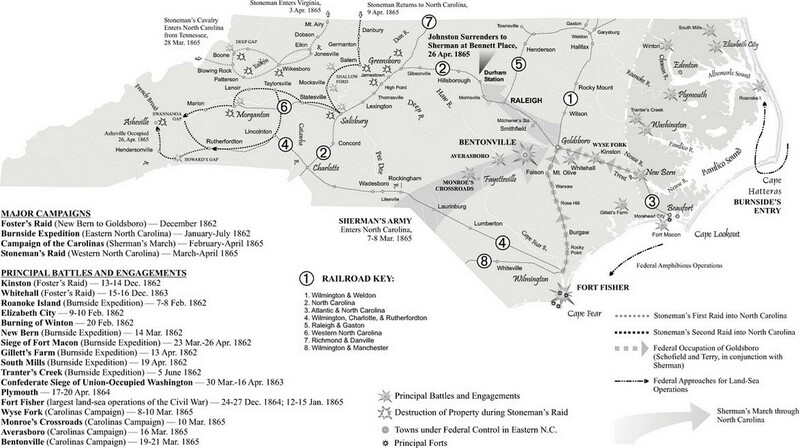 (Right) Map of the principal battles fought in North Carolina. The Burnside Expedition, which was contested during four months, consisted of the Battle of Roanoke Island (aka Fort Huger), Battle of Elizabeth City, Battle of New Bern (aka New Berne), Battle of Fort Macon, Battle of South Mills (aka Camden), and Battle of Tranter's Creek. The Battle of Roanoke Island, February 7-8, 1862, was the initial battle of the Burnside Expedition. On Feb. 7, a hundred vessel Union flotilla steamed down Croatan Sound to land an amphibious force on Roanoke Island after destroying a small Confederate fleet in Albemarle and Pamlico sounds. Brig. Gen. Ambrose E. Burnside led 15,000 U.S. Army troops while Flag Officer Louis M. Goldsborough commanded the naval contingent. By capturing the island, the Federals would have a base from which to attack Confederates in North Carolina from the sea. About 3,000 Confederate soldiers under Col. Henry M. Shaw opposed the landing, and Flag Officer William F. Lynch’s three-gun battery and seven gunboats supported them. Three forts stood on the northwestern part of the twelve-mile-long island, but were not positioned so they could help. Lynch led his gunboats out against the Federal fleet, but Goldsborough defeated them and landed the Union troops at Ashby’s Harbor. By midnight, the Federals occupied the beach, and at 8:00 a.m. the next morning, they set off in pursuit of the Confederates, who were retreating north. About halfway up the island, Burnside’s men encountered the battery and a force of 1,500 but soon outflanked them. The Confederates retreated once again, then surrendered near the northern tip of Roanoke Island. Fort Bartow’s guns opened the Battle of Roanoke Island on Feb. 7, and while the fort subsequently was bombarded by the Federal fleet for seven hours, it would continue to return fire but with little effect. On Feb, 7, Federal ships began a bombardment of the three Confederate earthen forts (Fort Bartow, Fort Blanchard, and Fort Huger) on the west side of Roanoke Island. Fort Huger was the northernmost and largest of the forts with twelve guns mounted in its sand parapets. The forts were designed to protect the mainland from Federal invasion and to complement obstructions placed in the channel. Forts Huger and Blanchard were not actively engaged in the Battle of Roanoke Island and were ineffective in the battle because the Union fleet maintained a safe distance relative to the range of the cannons placed at those forts. 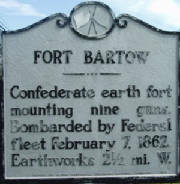 Bartow was the only island fort actively engaged in the fight. 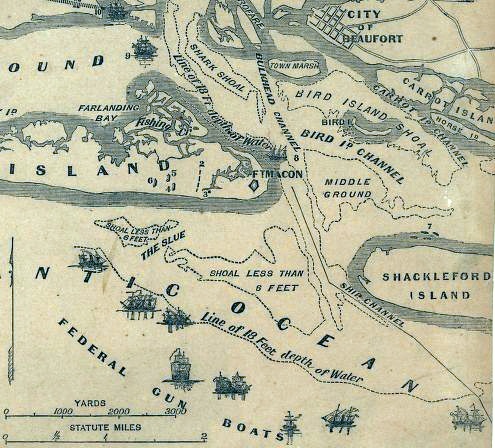 The Confederate fleet, under the command of Captain W. F. Lynch, waited to engage the Federals behind a line of obstructions placed in Croatan Sound to retard the Federal advance. The line of obstructions in the channel consisted of 16 sunken ships and pilings, which were meant to damage the undersides of ships passing through the waters However, the Confederates, after a sharp engagement which was ended only by darkness, were forced to retire due to lack of ammunition. Southern strongholds in the region included Fort Bartow, which was the southernmost Confederate defense. It was one of three Confederate earthen forts on the west side of Roanoke Island (the others were Fort Huger and Fort Blanchard) and it fort mounted nine guns. Of the three forts, Bartow was the only one actively engaged in the Battle of Roanoke Island. Constructed in the fall of 1861 of reinforced sand, Fort Blanchard was the smallest of the three and mounted four guns. The fort saw no action during the Battle of Roanoke Island as its guns were out of range of the main Federal operations. 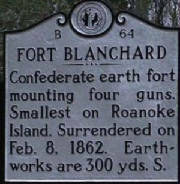 Fort Blanchard was surrendered on February 8, 1862. 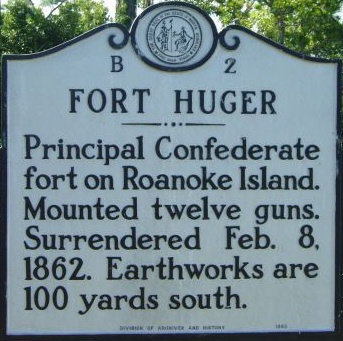 Mounted with twelve guns, Fort Huger was the principal Confederate fort on Roanoke Island. It too was surrendered on Feb. 8. Fort Forrest was a small mainland Confederate fortification on the western side of Croatan Sound and it consisted of two shore bound barges equipped with seven 32 pound cannon. The position was directly opposite Fort Blanchard on Roanoke Island and its construction amounted to an attempt to block passage through the channel by Union gun boats. 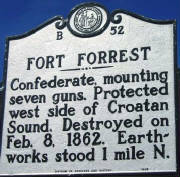 Fort Forrest would be destroyed by Federal forces during the second day of fighting. On Feb. 8, the Federal fleet again bombarded various positions on Roanoke Island including Fort Blanchard and Fort Forrest in support of General Burnside’s land offensive. After the Union victory on the afternoon, a detachment of Federal ships under the command of Commodore S. C. Rowan was sent into Albemarle Sound in pursuit of the Confederate fleet. As a consequence, Union forces were in control of most of the inland waters of northeastern North Carolina. Burnside next turned his attention and efforts on New Bern (spelled New Berne at the time). Confederate General Lawrence O. Branch, commanding an inadequate number of troops in that area, decided to defend the city in fortifications located approximately six miles south and adjacent the Neuse River. Burnside, however, landed his men twelve miles downriver on March 13 and began marching toward New Bern. Determined to smash the Union invaders, Branch had redeployed his Rebel force closer to the city, and his men now braced for the attack, which began the next morning. Although the Confederates withstood the advancing Union troops for several hours, eventually the Rebel center collapsed, and Branch’s soldiers retreated. Some Confederates, after they crossed the Trent River into New Bern, and as Federal gunboats shelled them, burned the bridge behind them. Realizing his position was untenable, Branch withdrew his men by rail to Kinston. Burnside’s powerful force occupied New Bern the next day, and remained in Federal hands until the end of the war. Confederate General George E. Pickett attempted to recapture it in 1864 but failed. Burnside would next move on and then capture both Beaufort and the Southern stronghold Fort Macon. For his laudable successes, Burnside would be promoted on March 18. 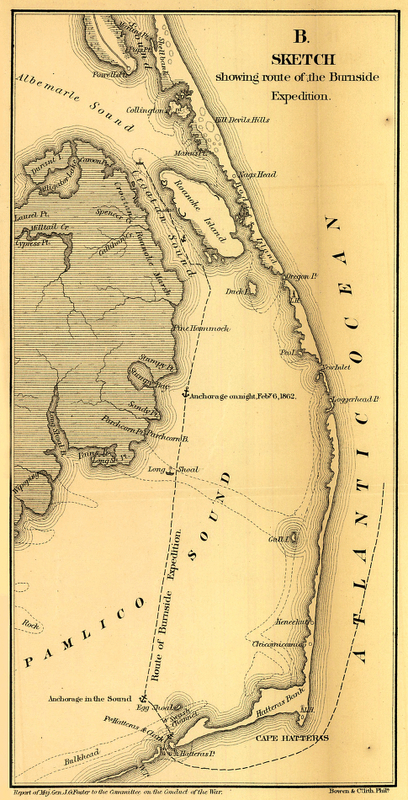 (Map) Entrance to Beaufort harbor, N.C., showing the position of Fort Macon and vicinity. (Right) The Atlantic Coast of North Carolina was protected by a series of barrier islands, and control of the islands and the bodies of water west of them known as sounds was crucial for both sides during the Civil War. Losing the coast would place most of eastern North Carolina in danger and threaten the critically important supply line on the Wilmington and Weldon Railroad. By June 1862, Burnside had occupied Roanoke Island, New Bern, Morehead City, Beaufort and Washington, North Carolina. Colonel Robert Brown Potter was placed in command of the Union garrison at Washington. Potter ordered a reconnaissance from the garrison under Lt. Col. Francis A. Osborne. Osborne's men ran into the 44th North Carolina under Col. George Singletary. After a brief fight, the Confederates retreated and Osborne returned to Washington. It was a small fight with no far reaching consequences but it was to be the last battle of Burnside's expedition. Confederate President Jefferson Davis's new military adviser, Robert E. Lee, saw the importance of North Carolina and now Confederate reinforcements were pouring into the region. Burnside was preparing for a drive against Goldsborough, his next major objective, when he received orders to return to Virginia with any reinforcements he could spare to aid in the withdrawal of General McClellan's forces after being defeated attempting to capture the Confederate capital. Burnside departed on July 6, 1862, with 7,000 troops and returned to Virginia. These troops would become the nucleus of the IX Corps. By direction of Burnside, General Foster remained in the area with a command of 8,000 troops. Foster commanded an expedition against the railroad at Goldsborough, which he destroyed at the end of 1862. The fighting in North Carolina would next devolve into a series of raids and skirmishes. Not until the capture of Fort Fisher and the march of William T. Sherman's armies in 1865 would there be another major campaign in North Carolina. References: John G. Barrett, The Civil War in North Carolina (1963); John Stephen Carbone, The Civil War in Coastal North Carolina (2001); Lorenzo Traver, Burnside Expedition in North Carolina: Battles of Roanoke Island and Elizabeth City (1880); Richard Allen Sauers, The Burnside Expedition in North Carolina (1996); North Carolina Office of Archives and History; Official Records of the Union and Confederate Armies; Library of Congress; National Archives.